I was browsing online for some essentials in my blogging such as laptop, flash drive and camera when I chanced upon buy.com holiday special offers. Actually I really need another USB flash drive so I can bring my files anywhere I go. I’m eyeing the 16GB flash drive because this will surely store my files and save some music and movies too. 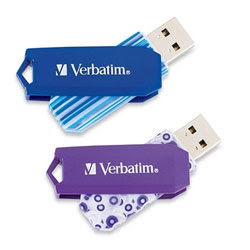 But look what I’ve found also – a fashionable mini USB in blue striped and purple dots stylish design, it’s so cute and very handy also!